Oriental sweet potatoes, also known as Japanese sweet potatoes or Japanese yams, have a reddish skin that exhibits a bitter flavor, so these potatoes are usually served without it. As with traditional sweet potatoes, oriental sweet potatoes are rich in carbohydrates, with minimal fat and protein. You can cube Oriental sweet potatoes and use them in stir-fry dishes or roast them. Oriental sweet potatoes are rich in calories, as each 6 oz. potato provides 240 calories. This amount comprises 12 percent of your daily calories, based on a 2,000-calorie diet. Due to the high calorie content, oriental sweet potatoes may not be ideal for dieting, as it would take a significant effort to burn off those calories. It would take 49 minutes of playing volleyball or 56 minutes of canoeing to burn off 240 calories. Oriental sweet potatoes are high in carbohydrates, as this nutrient comprises more than 92 percent of the calories in each potato. A 6 oz. oriental sweet potato contains 57 g of carbohydrates, with 36 g of sugar and 5.6 g of dietary fiber. Consuming adequate levels of dietary fiber is vital for good health, as this nutrient promotes satiety and digestive health. Dietary fiber may also help keep your cholesterol levels in check. 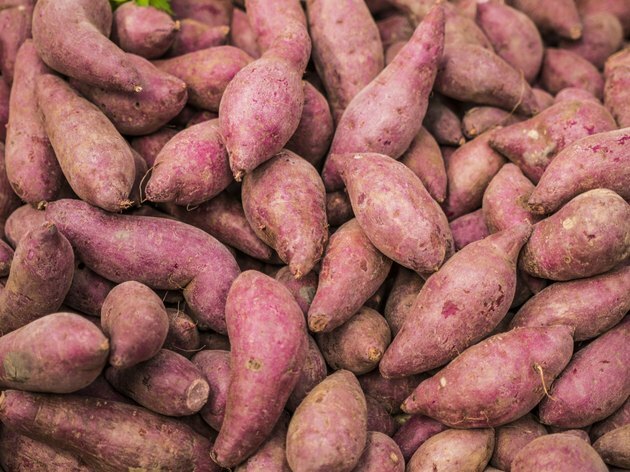 Men should consume 38 g of fiber daily, while women should consume 25 g.
As with other types of potatoes, oriental sweet potatoes are nearly devoid of protein. Each 6 oz. oriental sweet potato provides 3.5 g of protein, which is less than half of what an 8 oz. glass of milk provides. Protein helps your muscles recover from exercise and is essential for proper growth. Oriental sweet potatoes are low in fat, with just .4 g per 6 oz. potato. Dietary fat is essential for life, as it helps provide energy and aids in the absorption of certain nutrients, known as fat-soluble nutrients. You can add healthy fat to your sweet potatoes by topping them with nut butter.